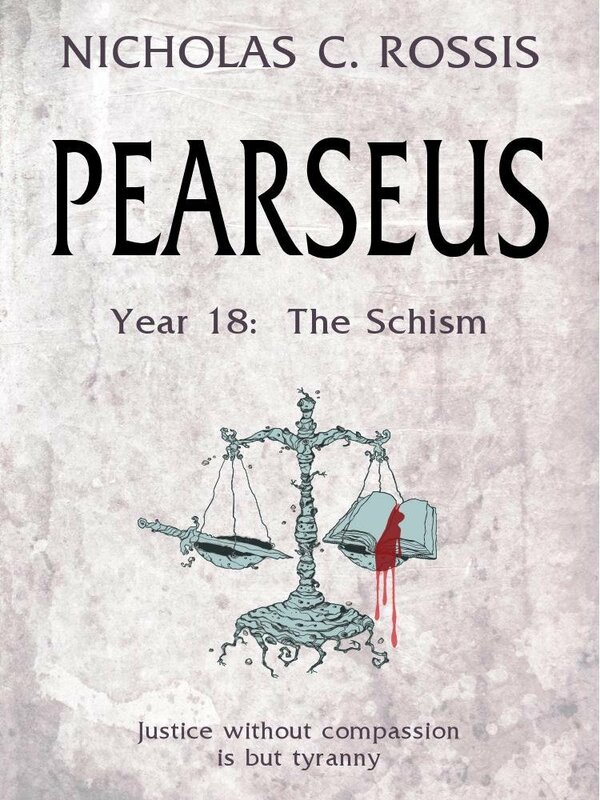 Rossis’ Pearseus Year 18 – The Schism begins upon the spacecraft UES Pearseus, as those aboard – celebrities and dignitaries – celebrate New Year’s Eve and the dawning of a new millennium. However, disaster strikes as First Mate, Gerard Croix – under the influence of voices in his head – throws the ship into FTL. The ship, unprepared, jerks through time and space and begins to tear apart, killing hundreds on board. Those able to get to escape pods successfully manage to leave the ship, crash landing on a nearby planet. It is here that engineer Lucas Rivera comes into his own. As the years progress and the likelihood of rescue diminishes, the survivors, aided by Rivera, gradually create a fully functioning society complete with judiciary system and city council. It’s following the death of the ship’s Captain in ‘Year 18’ however, that problems begin to arise. First Mate Croix (think Tim Curry, in any film he’s ever been in) starts a campaign with the ambition of becoming Dictator; still guided by the voices he’s hearing in his head. With the Captain no longer around, he goes off the deep end. Big style. Fractures open in society, riots begin and law dissolves as Croix’s personal force – the armbands – begin to exact his new orders. What follows? Suffice to say there are twists and turns, and situations that do well to provoke serious thought on the implications of actions and deeds on a fledgling society. Short prequels or introductions can be a great way for a reader to decide if the rest of the series is worth pursuing. 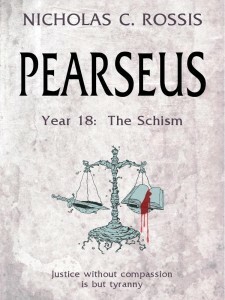 Luckily, Nicholas Rossis’ 56-page Year 18-The Schism is a strong introduction to the Pearseus series and certainly whet my appetite sufficiently to warrant further exploration.